RELIGION IN GOVERNMENT – Uncle Sam was Crying… Now he's out to change Washington. George Washington and Abraham Lincoln knew, encouraged, and proclaimed the importance of Religion. 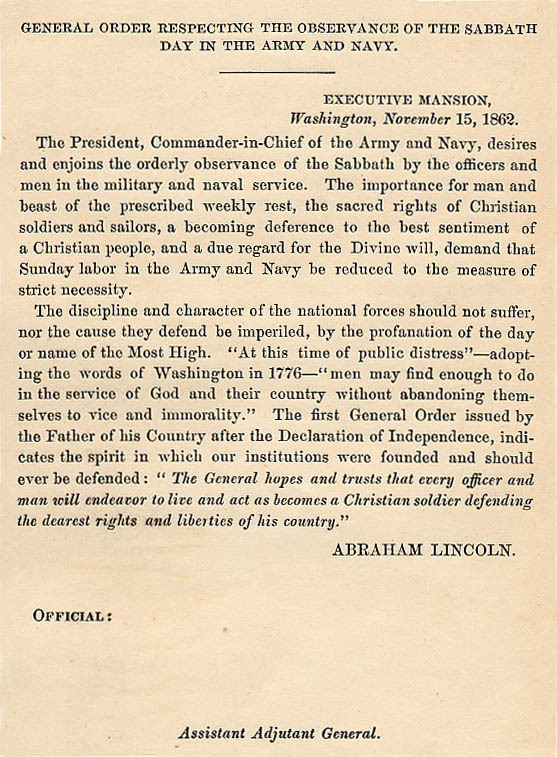 In 1862, President Abraham Lincoln issued this General Order regarding the observance of the Sabbath in the military. President Lincoln quoted two separate General Orders (February 26, and July 9, 1776) issued by George Washington during the Revolutionary War. The President, Commander-in-Chief of the Army and Navy, desires and enjoins the orderly observance of the Sabbath by the officers and men in the military and naval service. The importance for men and beast of the prescribed weekly rest, the sacred rights of Christian soldiers and sailors, a becoming deference to the best sentiment of a Christian people, and a due regard for the divine will demand that Sunday labor in the Army and Navy be reduced to the measure of strict necessity. All Officers, non-commissioned Officers and Soldiers are positively forbid[den from] playing at Cards, and other Games of Chance. At this time of public distress, men may find enough to do in the service of God and their country without abandoning themselves to vice and immorality. The Hon. Continental Congress having been pleased to allow a Chaplain to each Regiment, with the pay of Thirty-three Dollars and one third pr month—The Colonels or commanding officers of each regiment are directed to procure Chaplains accordingly; persons of good Characters and exemplary lives—To see that all inferior officers and soldiers pay them a suitable respect and attend carefully upon religious exercises. The blessing and protection of Heaven are at all times necessary but especially so in times of public distress and danger—The General hopes and trusts that every officer and man will endeavor to live and act as becomes a Christian soldier defending the dearest rights and liberties of his country.